The MATLAB-- "MATrix LABoratory"--computational environment offers a rich set of capabilities to efficiently solve a variety of complex analysis, simulation, and optimization problems. Flexible, powerful, and relatively easy to use, the MATLAB environment has become a standard cost-effective tool within the engineering, science, and technology communities. Excellent as a self-teaching guide for professionals as well as a textbook for students, Engineering and Scientific Computations Using MATLAB helps you fully understand the MATLAB environment, build your skills, and apply its features to a wide range of applications. MATLAB files, scripts, and statements, as well as SIMULINK models which can be easily modified for application-specific problems encountered in practice Readable, user-friendly, and comprehensive in scope this is a welcome introduction to MATLAB for those new to the program and an ideal companion for engineers seeking in-depth mastery of the high-performance MATLAB environment. SERGEY EDWARD LYSHEVSKI is Professor of Electrical Engineering and Professor of Microsystems Engineering at the Rochester Institute of Technology. Professor Lyshevski received his MS and PhD from the Kiev Polytechnic Institute in 1980 and 1987, respectively, and currently holds the Gleason Chairman professorship. The author of eight other books and author or co-author of more than 300 articles and papers, Dr. Lyshevski also serves as the Senior Faculty Fellow at the U.S. Surface and Undersea Naval Warfare Centers. His current research and areas of expertise are in design and analysis, synthesis and optimization of novel MEMS, the development of the fundamental theory of micro- and nanoscale systems, devices and structures, and in nanocomputers and their components. MATLAB Functions, Operators, and Commands. MATLAB Applications: Numerical Simulations of Differential Equations and Introduction to Dynamic Systems. 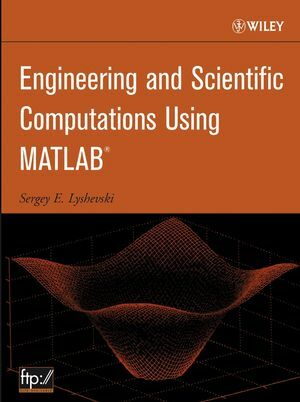 Appendix: MATLAB Functions, Operators, Characters, Commands, and Solvers. An Instructor Support FTP site is available from the Wiley editorial department.